a 15% discount off the second course!!! TOEFL iBT Preparation: This class will give you additional practice for the Internet-Based TOEFL. 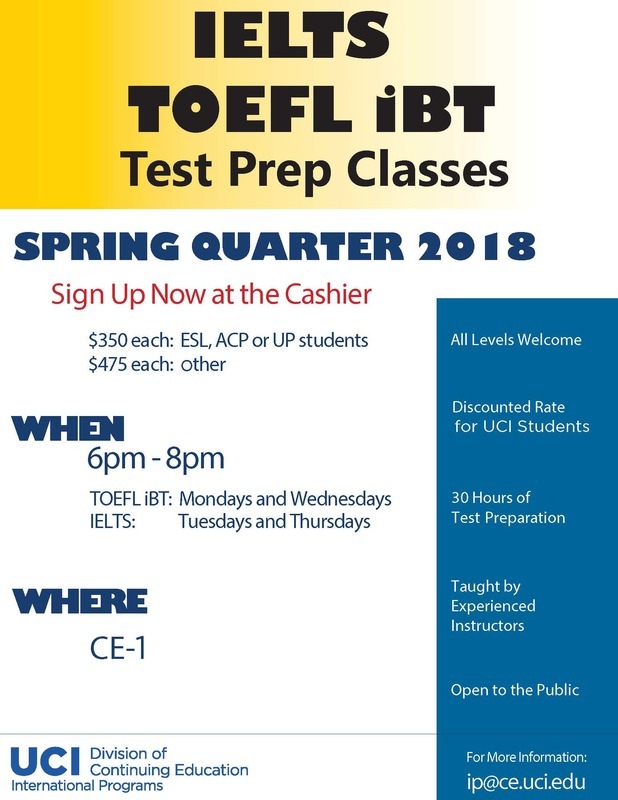 Students will become more familiar with the format and content of the TOEFL iBT. You will also have the opportunity to improve speaking and listening skills helpful for the TOEFL iBT. Uses a book. IELTS Preparation: This class will give students additional practice for the International English Language Testing System. Students will become more familiar with the format and content of the IELTS and also practice the four modules of the. Uses a book. Simply download the enrollment form below for the course you want. Pay at the UC Irvine Division of Continuing Education (DCE) Cashier.